New Delhi: Newly-appointed Congress general secretary in-charge for eastern Uttar Pradesh, Priyanka Gandhi Vadra, made two political debuts Monday — a no-holds barred roadshow in Lucknow, and a blue-tick Twitter launch. 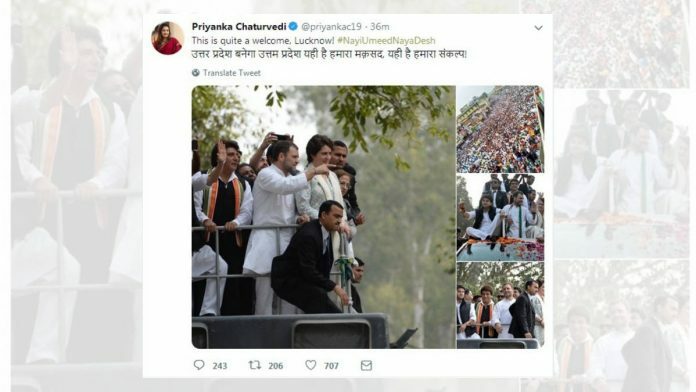 However, amid the political buzz surrounding the new entrant, Priyanka’s namesake and Congress spokesperson Priyanka Chaturvedi posted a nearly two-month-old image to applaud the success of the Lucknow rally. Priyanka and Congress president Rahul Gandhi’s rally sounded the poll bugle in Uttar Pradesh ahead of the Lok Sabha elections due in April-May. Of the four images Chaturvedi posted, three are shots of Priyanka and Rahul at the roadshow. However, the fourth image, clearly intended to demonstrate the turnout, is not from the Lucknow rally at all. 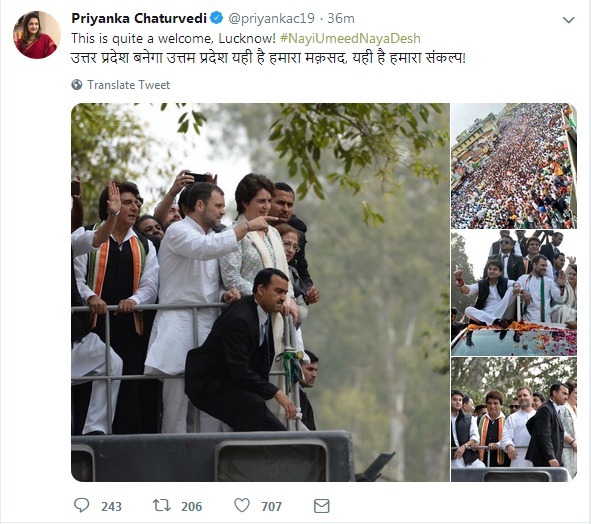 The image used by Chaturvedi is actually from a Congress rally in Telangana ahead of the assembly elections in December 2018. At the time, the image was shared by Telangana Pradesh Congress Chief and former Indian cricketer Mohammed Azharuddin. “Campaigning in my home state of Telangana is always more than special. The love and enthusiasm of the people is overwhelming,” Azharuddin wrote on 5 December. The image was also shared on the same day by National Youth Congress Campaign in-charge Srivatsa. In KCR's assembly constituency, Congress held one of the biggest ever roadshows ever in Telangana. “In KCR’s (K. Chandrashekar Rao) assembly constituency, Congress held one of the biggest ever roadshows ever in Telangana,” wrote Srivatsa. While the image she shared Monday is certainly of a roadshow, Chaturvedi missed the mark in identifying the location. She deleted the tweet subsequently and posted correct images.